Gall bladder removal surgery. 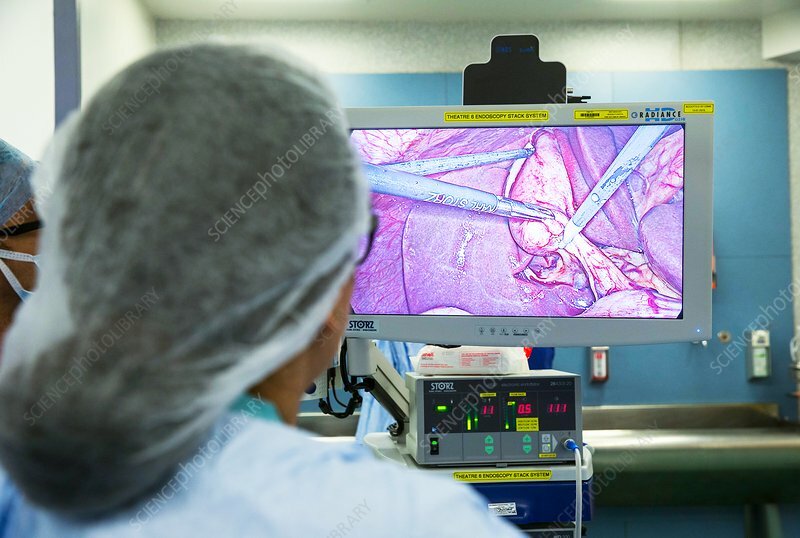 Surgeons carrying out laparascopic gall bladder removal, with the surgical site shown on the screen. The gallbladder is a sac that stores bile from the liver and releases it into the intestines for use in digestion. A laparoscope is an endoscopic device designed to be used in the abdomen, with the surgical tools inserted through keyhole ports (minimally invasive surgery). The term for surgery to remove the gallbladder is cholecystectomy. The cystic duct is clamped and then cut, allowing the gallbladder to be removed. This is typically done to treat severe gallstones or cancer of the gallbladder. Photographed in the UK.